Soy gluten is made from the combination of wheat gluten and soy bean gluten. Contrary to tofu, it has a chewy texture. When deep fried, its volume expands, creating a crispy exterior. 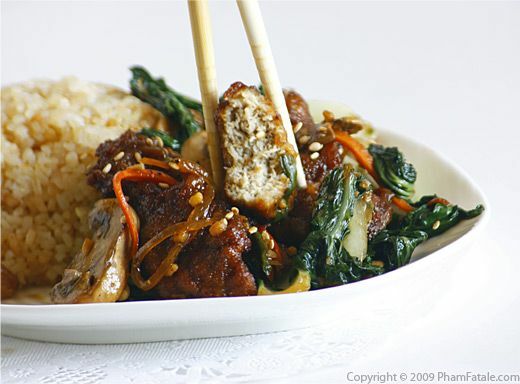 The gluten shrinks when dipped in the black bean sauce creating a meaty texture. I used the same method as my sunken tofu so that the soy gluten absorbs all the flavor of the sauce. What I love about this recipe is that it is probably the only dish that Lulu and I get to enjoy eating together and feeding each other. 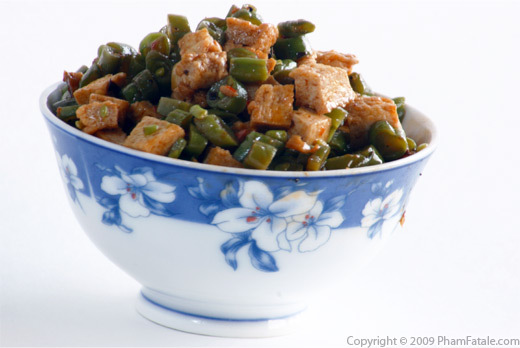 The soy gluten has a similar texture to meat, but with a very different taste. So if you're a carnivore like me, you'll enjoy this dish as much as I do. To be honest with you, I'm not a big fan of vegetarian food. I have been cooking a lot of veggie dishes since I got married, but I don't really enjoy them without adding some meat. I keep complaining to Lulu how much I would love to be able to share a meal together. I've tried to convert my husband into a meat eater for almost 5 years, but I've been wildly unsuccessful. So in a way, one could say that this is my recipe for a happy marriage. Pat dry the soy gluten with paper towels. Remove as much liquid as possible. You don't want any splatter of oil when deep frying it. Set aside. In a wok, dry toast the sesame seeds for about 1-2 minutes. Transfer to a plate and set aside. Heat about a tablespoon of oil in the wok. When the oil is hot ready, add a teaspoon of garlic. As the garlic becomes slightly golden, stir-fry the julienned carrots for about 2 minutes. When the color is translucent, season with 1/4 teaspoon of mushroom seasoning. Add the onion slices and cook for another minute. Transfer to a plate. Set aside. Repeat the same procedure for the choy sum and mushrooms. Separate the stems from the leaves. Cook the stems first for about 2-3 minutes. Add about 1/2 teaspoon of mushroom seasoning. Add the remaining choy sum leaves and mushrooms. Cook for another 2 minutes. Transfer to a plate. Don't overcook the vegetables as they will continue cooking in the black bean / soy sauce. Set the plates aside. Remove the wok from the sauce. 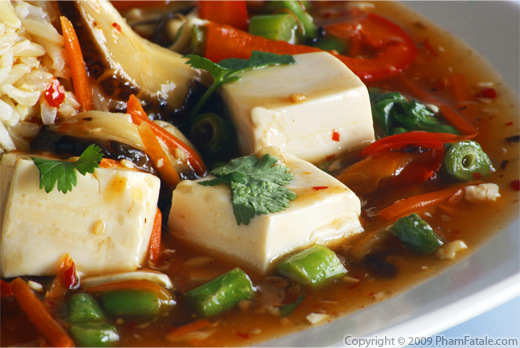 While the wok is still warm, add the black bean sauce, chili garlic sauce, sugar and soy sauce. Stir well and set aside. In a sauce pan, heat 1 cup of oil for about 2 minutes. The key to a good soy gluten to get little bubbles when the gluten is in contact with the oil. Place big chunks of soy gluten one piece at a time, make sure the gluten pieces don't touch each other. Lower the heat to medium. Deep fry for 2-3 minutes, the gluten will start to pop and increase in volume. I use a splatter screen to prevent the oil from jumping everywhere. Flip each piece and cook for about a minute. Pick each soy gluten piece using wooden chopsticks, drain as much oil as possible and immediately transfer the fried gluten into the wok. The gluten will absorb the black bean / soy sauce mixture instantaneously. Repeat until all the soy gluten pieces are ready. Bring the wok back on to high heat. Add the vegetables (mushrooms, carrots, onions and choy sum). Stir constantly until all the soy sauce is absorbed. Add the Thai basil and cilantro. Toss well. Drizzle a little toasted sesame oil. Sprinkle black pepper. Turn off the heat. Keep on the stove for about 5 minutes. Transfer to a serving platter. Garnish with toasted sesame seeds. Serve immediately with some soy sauce stir-fried cơm tấm rice and nước chấm dipping sauce. You can find soy gluten in any Asian stores. I prefer the texture of fried gluten to braised gluten, which is quite spongy. 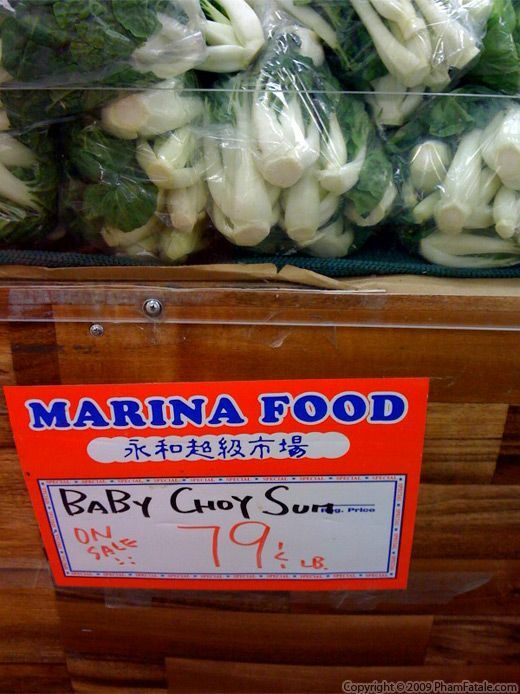 Baby choy sum is quite similar but much sweeter to bok choy. The stems are a white color whereas bok choy is a pale green. You can find it in most Asian stores. My favorite soy sauce is the Da Bo De brand. It has a very nice flavor and is not too salty. You can find this particular sauce in downtown San Jose, like at Dai Thanh Asian market on 420 S 2nd St, in San Jose. Make sure the bottle says nước tương chay, which means vegetarian in Vietnamese. You can use store-bought black bean garlic sauce and chili garlic sauce, like the one from Lee Kum Kee. 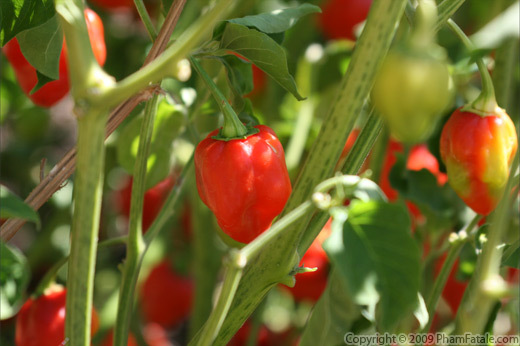 It's just that my husband grew so many habanero and Thai chiles this summer. We got a whole box full. I always make batches of chili garlic sauce. It's called tướng ớt (click on link for the recipe), literally spicy dipping sauce in Vietnamese, it's ultra easy. 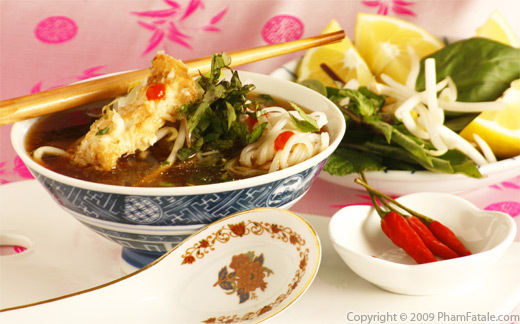 The preparation of deep-frying the soy gluten is pretty simple to execute. You just need to be very careful on the temperature of the peanutoil when you fried the soy gluten so that it really expands in volume and deflates when it is dipped in the black bean / soy sauce mixture and absorbs all its flavor. To guarantee a good absorption of the black bean / soy sauce by the soy gluten, make sure you don't add too much oil to the mixture. After deep-drying all the gluten pieces, just discard the oil. Mushroom seasoning salt brings a very distinct earthy flavor to the veggies. If you don't have any, you can always substitute with regular salt. You can get mushroom seasoning salt at any gourmet specialy store or in most Korean stores. I get mine at the Marina -10122 Bandley Drive -Cupertino, CA 95014. They also have a great food-court. I love their Chinese duck. I use Thai basil (from the garden) which has a more potent, earthy fragrance. 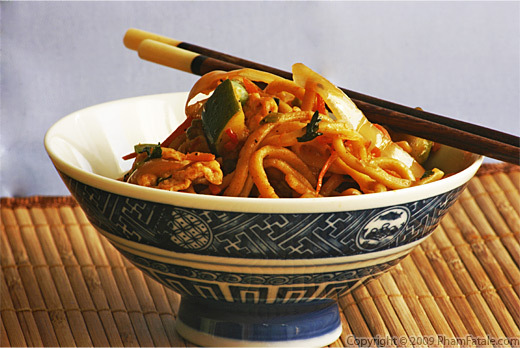 The addition of the sesame oil at the end is optional but brings a nice fragrance to the dish. Cơm tấm is a Vietnamese specialty rice. It translates to broken rice. You can find it in most Asian stores. 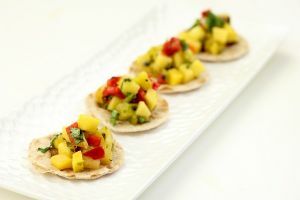 If you're looking for other vegetarian or vegan recipes, clik on the links. 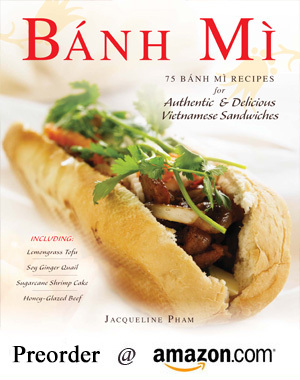 Published By: Jacqueline Pham on August 30, 2009. But...now for me...this DOES look good. You are such a great cook...and your photos are excellent. Love the color & texture of the recipe! mmm, the soy gluten looks so yummy, i wish i could eat it off your page!! You're absolutely right. I did a little research and it was mislabeled at the Korean store. Thanks for catching this error! Green choy sum has long green fleshy stalks with dark green oval-shaped leaves. It's often served in dim sum restaurants with hoisin sauce. There are several kinds of Asian greens, all belonging to the pak choy family. You can use any of these vegetables for this dish. I have never heard of this before, but it looks intriguing and delicious., my father in law is vegetarian, and he is hard to cook for, but I am sure he would love this! What a beautiful dish! I have never worked with soy gluten. This dish sounds and looks great! Meals can be full of compromises...but when my husband is gone for dinner and I am eating exactly what I want, I do miss him. I'm with you on the meat thing. But there are these rare dishes where you just don't miss the meat. This recipe sounds fantastic. Even with no meat, the deep fried soy gluten certainly sounds delish. Just the kind of vegetarian meal I'm craving right now. Bonjour de Bruxelles, Jacqueline! We have the opposite situation with three cultures in our family: I'm the veg, my husband is a confirmed meat eater, and his kids/my stepkids are Muslim-hallal North African, and our baby daughter is just starting solid food next week! It would be great to share a meal... I make gluten often, but didn't know how to deep-fry it and put it in sauce. Thanks for sharing this recipe, I've got to try it out! I love how you tried to convert your husband to meat eating! My boyfriend is also a vegetarian but it's resulted in me just reducing my meat intake to about 20%! It only becomes a problem in the kitchen or eating out when he also stops eating seafood starting in May! 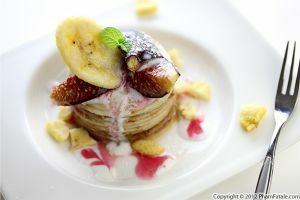 The dish by the way looks delicious and can't wait to try it!